Nowadays the village of Tučepi is recognized as a popular tourist destination in the guidebooks of modern Croatian and European travellers. However, thanks to its favourable geographical position, Tučepi has been a settlement for four thousand years. To the west its boundaries touch the town of Makarska, the only urban centre of the area called the Makarsko primorje in Croatian i.e. the Makarska Coastland. or popularly the Makarska Riviera. The imposine mountain of Biokovo represents the northern border of the village. The hamlets of Tucepi: Podpec. Covici, Srida sela, Šimici and Podstup, built in traditional Mediterranean style, are spread over a large area of coastal limestone slopes. Rich in natural water springs, the area abounds with terraced eardens, vineyards and olive-groves. One of the hypotheses concernine the Illyrian origin and the meaning of the toponym is based on the preserved Old Illyrian elements in the Albanian language which would mean "a village at the source". Both, the toponyms and the archaeological finds point to the conclusion that the village was inhabited in Illyrian times: the hillforts in dry-wall construction with the typical tumuli (ancient burial mounds) on their tops. All the names the inhabitants gave to these hillforts would mean the same: a site where a buildine stood. So vou will find Gradine (on the slopes of the hill Sutvid), Gomile (on the localities of Sutvid and Ravnice), Gradac (not far from the sea shore), and Grad (above the road leading from Srida sela to Podpeci. The oldest find witnessing the existence of a settlement is a necropolis on the soutb slopes of the hill Sutvid, which dates from the period of Classical Antiquity (Romans, 1st cent.AD-6th c.AD). At the beginning of the twentieth century several stelae (upright stone slabs, used as monuments) engraved with inscriptions, human skeleton graves, various grave offerings and several specimens of Roman coins (2nd cent. AD-4th cent. AD) were found on the same site. To the east of the hill Sutvid, near the road that links the coastal area with the inlands, there is the site of Okrumbica. Numerous archaeological traces like remains of mortar walls, tegulae (tiles), fragments ot various ceramics and an iron spear, provide evidence proving that a Late Antiquity settlement might have existed on the locality. The site of Javorak covers the broader area round the crossroads which connect the local ways between Covici and Podpec. Its position, and the accidental discovery of coins, walls and a necropolis made the famous Venetian traveller and author of the travelogue "Viaggio in Dalmazia" (Venice, 1774) Alberto Fortis ( 1141-1803) come to the conclusion that the locality could have been the site of the Late Antiquity Laurentum described by, Procopius, a Byzantine historian (500? - 565? AD). Besides the localities mentioned above, there are others that represent further evidence of the continuity of life in the Tucepi area. One of them, the church called Crkva Gospina rodenja (the church of Our Ladys Birth) is situated on the local cemetery in the south-east, above the coastal motorway). The other one, called Crkva svetog Jure (St. George'church). situated in the southwest of the village, is surrounded by the present-day hotel complex. St.George's church was built in 1311 and it has been preserved as a one-nave Romanesque-Gothic building with a semicircular apse. In the interior of the church everal consecration crosses, decorated in paint, have been preserved as well. Having been thoroughly explored by archaeologists and restorers, the church aas completely restored in the years 1992 and 1993. The site shows different periods of development: an Early Roman villa rustica ( 1st - 2nd cent. AD), a Late Antiquity oratory, a Middle Ages church with a necropolis and a seventeenth century coenobium, an annex attached later to the south part of the building. On the very top of the hill Sutvid there is a Prehistoric site with the foundations of St.Vid's church. It is supposed that the Croats, at the time of settling this area in the seventh century, used to worship their pagan God Svevid on the locality mentioned. After having been christened they turned the pagan temple into the Christian church. The Church of Our Lady's Birth was built in 1703 as a one nave building having all the features of the Dalmatian provincial Baroque style. In the earthquake of 1962 the church was badly damaged, so it was disassembled and restored to the original condition. By disassembling this baroque church, several decorative architectonic elements of the Early Christian church dated between the fifth and the sixth century were found in the foundations.In front of the west facade there are four medieval tablets engraved with the characterictic plastic decoration of the period: a representation of a sword and a shield with a rose or a half moon and a noss over the whole tablet. On the site there is also a stele ( 1st cent. AD) which represents the oldest sepulchral monument in the area of the Makarska Riviera. Earlier, it was supposed that the stele might have been the grave stone of the Venetian doge Pietro Candiano I, who was killed in the naval battle with the Neretvanians on September 18, 887, not far from the locality. A great number of Roman tegulae, marked with manufacturer's seals, antique, late antique, medieval and late medieval ceramics and glass finds, coins, earrings, and other metal artefacts dating from the tenth to the seventeenth century are the proofs of the long and turbulent past of Tucepi. At the same time. life was going on not only on the coast, but also in the hamlets on the slopes of the mountain Biokovo. The fact is witnessed bv the remains of the foundations of St. Martin's church with a necropolis on the site of Grebišce, to the northwest of the hill Sutvid. As the foundations show, the building has an east-west orientation; it is paved with stone tiles made bv local stone-cutters. The apse is rectangular from outside and semi-circular from inside, which corresponds with the style of many eleventh and twelfth century churches in Dalmatia. Throughout the late Middle Ages this area was reigned by Bosnian rulers, which is proved by the Charter of Kreševo, issued on August 12, 1434 by Juraj Vojsalic. It is in this Charter that the village of Tucepi was mentioned for the first time. The document was written in the Croatian language and the Bosnian alphabet (a variant of the Cyrillic alphabet). From the end of the fifteenth century until the end of the seventeenth century the Coastland was ruled by the Turks. Later on, during the eighteenth century, although the Venetian rule hed been set up. the local people, living in a frontier zone, used to take part on the Venetian - Turkish wars. This period characterized by wars and border disputes, has left several fortification objects, usually called towers, with the typical features of local building styles. All the towers are situated in the broader area of Gornji Tucepi. The Šaric tower is situated on the rock that juts out from the foot of the Biokovo. The Bušelic tower has a similar position, but it is nearer to the hamlet of Srida sela. The Lalic tower, situated in the village, is surrounded by the farmand residential - buildings. Overlooking the village from northwest side, above the hamlet of Podpec, there is a cliff with the remains of fortification and residential objects built in dry-wall techniques. 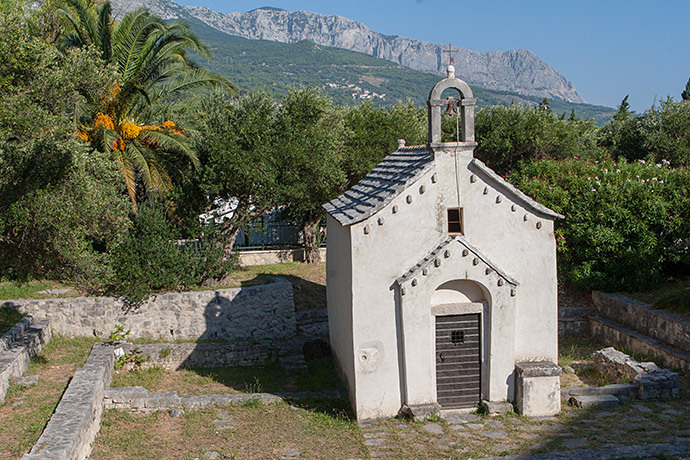 In these hard times the inhabitants of Tucepi managed to build St. Catherine's church (in 1541), which is located above the hamlet of Šarici. There is a built-in Romanesque transenna on its west facade; and there is a chapel of the same name near the church. built later than the church. People say that today's site of St. Roch's church, above the old parish house ( 1730), used to be the site of St. Anthony's parish church, which was built in 1602, renovated several times, and completely destroyed by fire in 1891. The building of the new parish church, which was dedicated to St. Anthony of Padua, began in 1898, in the part of the village called Srida sela; it was consecrated in 1901. This large and impressive building, dominating the village of Gornje Tucepi, was built in classic style with the marbled interior; the baroque altars had been brought from the old parish church. The Church of St. Nikola Tavelic, built in 1989. and situated near the coastal motorway in the part of the village called Kraj, is the most recent church building in Tucepi. In the coastal area of the village there are three baroque style country-houses, dating from the eighteenth century, built by the members of the well-off noble families of Grubišic, Ivaniševic and Kacic. The most impressive country-house, which belonged to the abbot Klement Grubišic, has been converted into a hotel; it is today's hotel "Kaštelet". The Grubišic family also built St. Michael's church in the hamlet of Podpec. Don Klement Grubišic (don, a title of a priest in Dalmatia and Italy from Latin dominus), a distinguished intelectual, was also mentioned in Alberto Fortis' travel records. Some historical facts and a little imagination could support the claim that don Klement Grubišic. a strong personality of a versatile mind, by welcoming his friends in his countryhouse, might have laid the foundations for the modern village of Tucepi on the coast. His eminent local and foreign guests, welcomed with open arms by their erudite host, used to carry their impressions of Tucepi all over the world. Welcome to WWW.TUCEPI.NET - starting point to explore Tučepi. 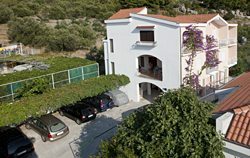 WWW.TUCEPI.NET offers full deep insight in almost all accommodation offer in Tučepi (Tucepi). Each accommodation unit is presented with many high quality pictures, floor plans, descriptions, positions by Google Map. There are no hidden informations like on other sites. Many pictures and video galleries explains how beautiful Tučepi is. We are hospitable, not only because it is our job. It is also our style of living. We are playing many instruments, singing all songs. Visit our villages nights and enjoy in all, free of charge at all. We offer best prices, because there are no intermediary and their additional commissions (20-30%). You book exactly accommodation as advertised and not some "typical" apartment. Thank you for visiting our site and you are welcome to visit our Tučepi too.